"No hoof, no horse" is a time-honoured saying in equestrian circles but I've never heard a cry of "No foot, no dog" in canine circles. And when I see judging at dog shows, I find it rare indeed to see a judge check a dog's feet. But which is more important, sound feet or set of tail? I suppose in an arena where dogs are valued solely for what they look like rather than what they can do, this is not surprising. Ignoring the soundness of your dogs' feet is however a recipe for disaster in breeding programmes. Unless sound feet are produced in every breed of dog from toy breeds to giant ones, then the future of the domestic pedigree dog as an active animal is threatened. If any group of dogs need sound feet it is the Pastoral Group. It is enlightening to look at the various breed standards and see what the different breeds are expected to walk on. 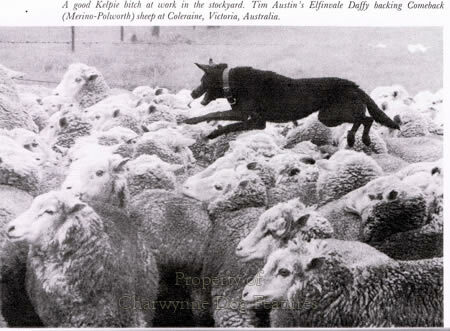 Taking the pedigree pastoral breeds, we come across some widely differing expectations, e.g. : the Shetland Sheepdog is required to have oval feet, as are the Swedish and Finnish Lapphunds, Swedish Vallhund, Pyrenean Sheepdog, Polish Lowland Sheepdog and the Pembroke Corgi but not the Cardigan variety, that have to be round. 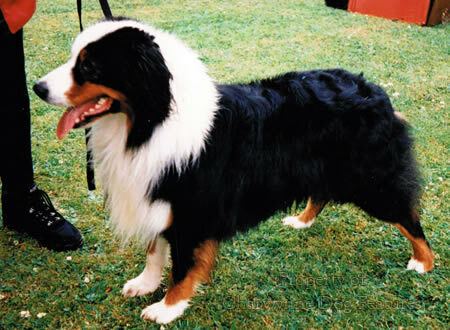 The Norwegian Buhund is expected to have rather small feet; the Old English Sheepdog, surprising, has to feature small round feet, the Maremma Sheepdog large almost round feet. Does that mean small for the size of the dog or small when compared to a bigger breed? If judges look out, in these breeds, for feet smaller in proportion to the size of dog than is sensible, is that right or wrong according to the breed standard? It is surely essential for each breed of dog to have feet of a size appropriate to its weight. It is even more damaging if a dog's feet are bred to a harmful design. Being able to walk is fairly important to dogs! How many judges look at the relative size of fore and hind feet? This is an important feature of balance in a dog. No working sheepdog would last a day without good feet. The Border Collie has to possess oval feet, as does the Bearded Collie, the Rough and Smooth Collies, the Shetland Sheepdog and the Polish Lowland Sheepdog. But the Old English Sheepdog is expected to have small round feet and the Belgian Shepherd Dog forefeet that are round and hindfeet slightly oval. The Australian Cattle Dog and the Australian Kelpie should have round feet but the Australian Shepherd is expected to have oval feet. Does it matter whether a herding dog's feet are round or oval? In her valuable book Foxhounds of 1981, Daphne Moore has written: "The foot of the foxhound is of the most vital importance. The terms 'cat-foot' and 'hare-foot' are frequently used, but the best type of forefoot is that which more resembles that of a wolf; a nice natural foot, on which the hound stands firmly, with the weight on all four toes and the heel." I would support that but I do see, especially in the smooth-haired breeds where it is more easily picked out, dogs in the ring with their heel-pad not touching the ground, when standing. Feet therefore need to be judged from the side as well as being examined individually. An examination of the wear on the pads themselves will reveal a balanced or unbalanced stance or gait. The appearance of a dog's feet has more to do with exercise than breed standards. Dogs with soundly-constructed feet will still develop splay feet and slack pasterns if exercised on pastureland that is lush and soft. Road work is essential and is usually recommended to 'tighten up' the feet, but rough cinder tracks are probably best. Shape of foot can usually be linked to function. I see coursing Greyhounds with long hare feet and show Greyhounds with cat-like feet and toes compactly bunched. But both those descriptions are flawed. How many dog owners have seen the underside of a hare's foot? Cat-like originally meant like the round compact feet of the cat family, rather than like the ginger tom next door. It is important to keep in mind too the origin of the breed when considering feet, i.e. what the breed was designed to do. Galloping breeds like the sighthounds have great freedom of the upper arm and elbows that are separated from the chest wall. The Greyhound's weight falls mainly on the toe-pads. The German Shepherd Dog's weight falls on to the heel-pad of the forefoot. The Greyhound is therefore usually seen more 'up on the feet' comparatively in its stance. The soundness or otherwise of the foot can affect the balance of a dog. If the heel-pad is not sharing the body weight of the dog with the toe-pads, then the latter are bearing extra weight and this will in time weaken the toes. The dog's knee will absorb what the toes haven't the strength to do. This is why at the turn of the century, when Foxhounds were favoured with massively timbered forelegs and a fleshy, contracted, bunched-up foot, so many stood over at the knee, to reduce the jarring. Such hounds had their weight all on the forehand, which in turn led to their shoulders becoming more upright. There is a danger in the pursuit of round, over-compact, knuckled-over, bunched-toed feet. From time to time, a committee of the Kennel Club looks at the wording of breed standards, in an attempt to avoid harmful end-effects on dogs from unwise written anatomical designs. The words on feet should receive their urgent attention. I am against a dog's feet being described in its breed blueprint as large, small, a different size fore and aft (as in the Hungarian Kuvasz’s standard) or being unhelpfully worded, as in the Estrela Mountain Dog, whose feet have to be 'Well made, neither very round nor excessively long' and in the Old English Sheepdog: ‘Small, round and tight’. How small? I’ve never seen a specimen in this breed with small feet! Who is not confused by the Pyrenean Sheepdog having to possess feet that are ‘Lean, rather flat, oval shape’. Who wants to own a flat-footed dog? Nearly every breed in the Pastoral Group has to have well-padded feet; when was the last time you saw a judge examine the soles of an exhibit’s feet? Feet are a vital part of the dog's anatomy, more important than 'bite', colour of coat, length of coat, set of tail, length and carriage of ears and pigmentation. Dog show judges should murmur to themselves "No foot, no dog" before they begin their duties, advancing 'feet first' in every ring. Before writing 'movement disappointing' in the critique, a judge should ask 'did I examine the feet'? The feet may not exactly be the mirror of the soul but the soles of the feet can so often reveal the quality of the dog. For me the quality of judges starts at the feet of the exhibits. At least the dogs judged by them can actually walk off with a prize! Much is made by breed enthusiasts of the importance to their breed of say double dew claws, or dew claws on the rear hind-leg as well as the front, as in the Beauceron and the Pyrenean Mountain Dog, with their respective Breed Standards emphasizing this feature. But I have seen judges at World Dog Shows check this ‘asset’ yet omit any check on flat or splay feet, not good for the dog. I have seen Spanish Mastiffs, Owtcharkas and our Rough Collies with quite appalling feet at shows – and the judges have never checked such a vital feature in the ring. Tight feet come from exercise but I have seen sheepdogs that operate entirely in soft pasture having well-spread toes, but never flat feet. There is an important difference. The soundness of the feet does of course affect the quality of the dog’s movement, just as the set of shoulders, the transmission from the hindquarters and the coordination between the front action and that of the rear is revealed to a watchful judge. 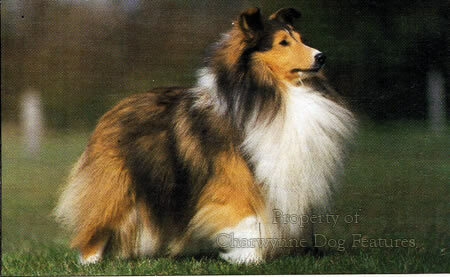 Whilst it is disappointing to see a Sheltie with too short a tail, the dentition of a Pom and a frail bone structure, it is deeply depressing to observe at Crufts, a Shetland Sheepdog win not just its breed ticket but the group one too when it displays a Hackney action, forbidden in its breed standard. It is tiresome to see yet another Old English Sheepdog get its breed ticket at Crufts demonstrating extremely poor hind movement. It is even sadder to see the Best in Show there clearly afflicted by a luxating patella in its right hind leg. If this is "the best of the very best" as the 1998 Crufts slogan assured us, God help the mongrels of England! There would be enormous merit in dogs at KC-licensed shows being judged on movement alone for a few years, especially in the so-called 'head' or 'coat' breeds. The shortcomings, indeed the deceit, of Crufts is covered later. It’s impossible to rate the importance of movement, how the dog moves, in judging show dogs, especially as so many are bred from. Overall soundness is always best assessed when the dog is on the move; unsoundness is unlikely to be concealed from the judge once he or she has studied the dog’s gait. It was therefore so pleasing to note that The National Association of Veterinary Physiotherapists (NAVP) chose gait analysis as the subject of its 2013 annual conference. This conference discussed the different aspects of the application of gait analysis to diagnosis, treatment and rehabilitation. Poor gait reveals poor conformation; poor conformation can lead to all manner of anatomical and locomotive problems in the dog. Future judges will be able to benefit from the findings and recommendations coming down from this NAVP conference. For over half a century I have watched judges considering the movement of the entry before deciding relative merit; one particular judge, the late Tom Horner, took infinite pains to study the movement of each and every exhibit, from different angles and at different speeds, and was wise enough to know its importance. Writing in her informative Showing and Judging Dogs of 1977, Hilary Harmar provided some valuable words on the effect on movement of anatomical unsoundness and abnormalities of the joint in show dogs: “Certain forms of unsoundness are not very noticeable when the dog is moving, and unsoundness may, for example, be detected by the way in which a dog with severe hip dysplasia stands. 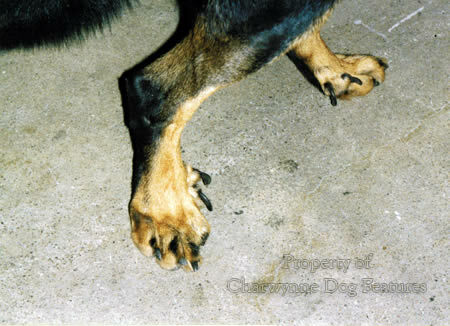 Similarly, a dog with weak stifles will from time to time stand with straight hocks and stifles, other dogs when standing may knuckle-over at the pastern joint. A straight stifle may alter the normally level top-line and give a tilted one. For example, over-angulation in one joint will automatically have to be compensated for in one or more of the joints nearest to the fault. Unsoundness is more often revealed when the dog gaits.” Despite such insight from a distinguished judge, it is not unusual to see poor judgement of movement in show rings today. If judges shape the breed of the future there is cause for worry. There used to be a saying in dog breeding circles: No animal is wel1-bred unless it is good in itself. I haven't heard it spoken off as a received wisdom for some years. Much more important than the names on the written pedigree is the ability to 'read' it, translate the names into physical content. As the great Scottish Terrier breeder, WL McCandlish wrote in his book on the breed: 'The names in a pedigree form are merely cyphers, designating certain groupings of features and certain sources of blood, and pedigree is of no value unless the breeder can translate what these cyphers mean.' Yet even some quite experienced dog breeders get dazzled by names on forms, rather than by dogs, supported by blood from distinct ancestors. The eminent canine geneticist Malcolm Willis has written: 'Never does pedigree information become more important than information on the dog itself.' We must always value dogs that are good in themselves. The pedigree form can be used to effect, but it can never herd sheep! Of course there are some good dogs in the ring, but pastoral breeds really have to be far sounder than dogs from the other non-sporting Groups. I have long admired Alison Grainger's Samhaven kennel of Rough Collies; the best test of any breeder is to produce top quality dogs consistently. I have been impressed from the ringside by multi-Ch Smooth Collie, Cligstone Sounds Good NV 12, owned by Laila Sehlin of Norway, a far sounder dog than many in this breed. Imports are coming in but bringing back old British blood in fact; perhaps the use of American blood would improve some lines. The Americans are ahead in terms of soundness and temperament, if not in head shape. It's good to see newcomers matching the old hands in the registration figures for this breed, but, for me, poor angulation is spoiling the breed, with the wrong slope of shoulder and short upper arms (as in the Australian Shepherd too) all too prevalent. Showiness can never be a better attribute than soundness; a sound dog leads a far better life. In the pedigree dog world, much is made of the stud dog of the year competition, which is entirely based on the show success of the progeny of often over-used sires. 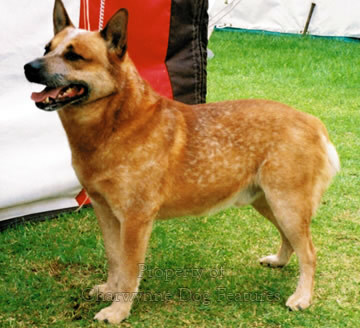 The progeny of such successful sires could have bitten children, savaged other dogs or died young of some inheritable disease. Is this truly the best we can do? Does this, as the leitmotiv of the KC puts it, improve dogs? When I was working in Germany nearly half a century ago, I learned of the work, in the German Democratic Republic, from a book by Dr FK Dorn, entitled Hund und Umwelt or Dog and the World Around Him i.e. his Environment. Dorn devised a system of four categories: A=Type, B=Appearance, C=Conformation and D=Temperament. Within each category, Dorn devised a numerical scoring system, in which, for example, Al=shelly, A8=too heavy and clumsy; BO=lack of pigmentation, B5=excellent appearance, outline and symmetry; DO= nervous or timid, D3=cautious, not self-assured and D8= unafraid but not aggressive. Such details could then be written on a dog's pedigree for use when breeding plans were being formulated. This became known as the Merseberg scoring system, after the GSD breed club there. Dorn was seeking to establish a clear picture of the hereditary qualities of the whole bloodline of a dog. But now, half a century later, our pedigrees merely list the ancestors for five generations, without any checks on their accuracy or the slightest whiff of real information about the dog. Is this progress? Is this in the best interests of good breeding? Prizes for phenotype and beauty are given sole weight and to hell with such basic information as health, intelligence and working ability. In livestock breeding, a stud has no value until the performance of its progeny has been established. But in the pedigree dog world, a stud is valued not on the performance of its offspring but on their imposing stance in the ring. Does that produce the best companion animals? The KC's self-imposed mandate is the improvement of dogs, not the improvement of show dogs. Is their remit being met? Have we truly progressed in the last century or so? When are we going to stop valuing our precious breeds of dog on their appearance alone, when it's their temperament that makes them a successful companion animal? Breeding for the pedigree and show-ring success is not the activity of either a real dog-lover or a true breed-lover; it can become a hobby for the mindless pursuit of winning for winning's sake, and it ruins distinguished breeds. In one half-century the Alsatian is renowned for its level topline, in the next it is desired to feature a 'banana-back' with its tail dragging along the floor. Such specimens may have great pedigrees, but they are not great dogs. Genuine dog-lovers know the difference! A Shetland Sheepdog lacking a full set of teeth and unable to chew a bone competently may have an impressive pedigree but will never be an impressive, or even a contented, dog. No pastoral breed exhibit should ever succeed in the ring without the construction its role once demanded. Sound dogs impress; unsound ones just suffer - in silence. Their pedigree never speaks!